During the holidays, you and your family might have some special traditions. One of ours is ensuring that every student in Porter-Leath’s Preschool program receives a meaningful gift this holiday season. We’re once again proud to be a title sponsor of Porter-Leath’s Toy Truck, and need your help in ensuring that every child receives a gift each holiday season. We’re hoping to receive over 5900 gifts this year. We’ve been able to ensure that every child receives a gift, and are hoping you can help us reach this number! We’ve made it easy for you to get involved. Simply fill out the form at the bottom of this page, and your Yuletide delivery driver will bring a box right to your door, along with a flyer to put in front of it. We’ll come back for your donations between December 6-9. 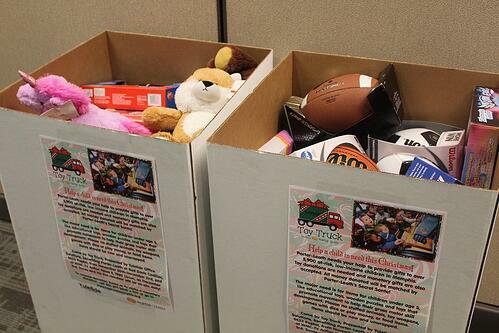 Please avoid donating toy weapons, games with dice or play money, or stuffed animals. Also, toys with smaller parts are also not recommended as the children receiving these gifts are under the age of five. December 9, 8 a.m. to 4 p.m.